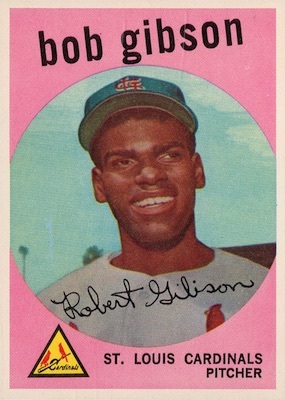 Anchored by the rookie card for Bob Gibson and other key Hall of Fame cards, 1959 Topps Baseball offers a big change for vintage collectors in comparison to the previous releases. 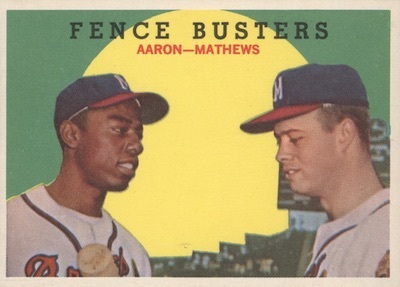 A new design, large checklist and a variety of subsets means that '59 Topps is as memorable as it is groundbreaking. 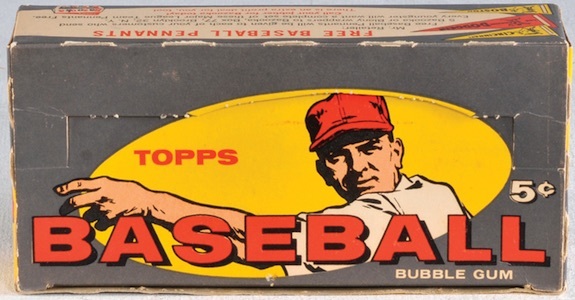 The 1959 Topps Baseball set was exceedingly large by the standards of the day, weighing in with an impressive 572 cards. 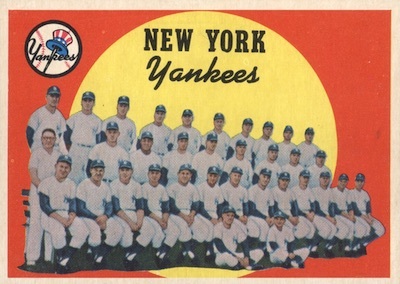 This was the largest Topps set in existence when it was originally released. The continued expansion of their core baseball card set was made possible thanks to the lack of competition Topps faced following the buyout of Bowman. However, the Fleer Gum Company attempted to take a bite out Topps' market share when they snagged the exclusive rights to Ted Williams for the 1959 season. 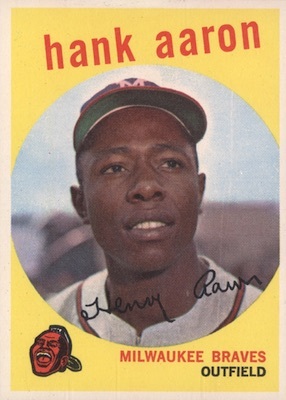 The 1959 Topps Baseball design was quite the departure from the normal method of using a player image against a colored background with accompanying text. 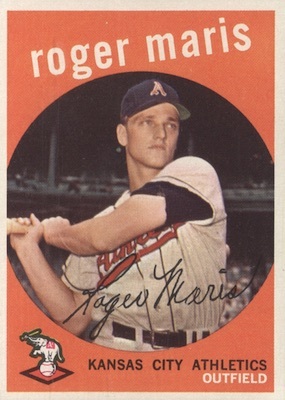 Instead, Topps used a modernized layout that features the player in a profile or full-length body pose. The player image is set inside a cut-out circle that showcases a colored bottom and top border area. 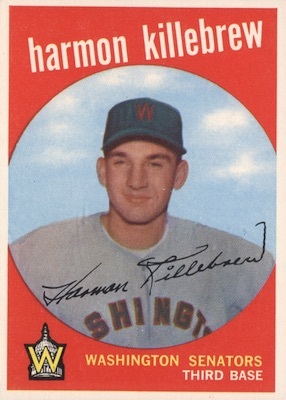 The player's name is printed in a bold lowercase font and set at a slight angle on the top area of the card. Finally, the bottom portion is reserved for the player's team name, logo and fielding position. The popular facsimile signature is written towards the bottom of the picture image, also at an angle. Combined, these elements helped to created the appearance that each 1959 Topps Baseball card is a matted, autographed photo. 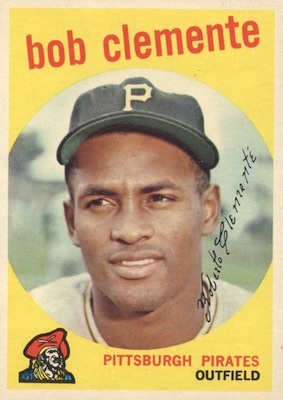 The card backs, however, still utilize a more traditional layout, detailing each player's name, hometown, and biographical information as well as yearly and career statistics. A cartoon is employed to highlight a memorable moment event in the player's life or career. Admittedly, it is tough to view the color scheme on the back and not expect an image of Santa Claus to appear. The 1959 Topps Baseball set size was able to be expanded by utilizing multiple subsets of themed cards. 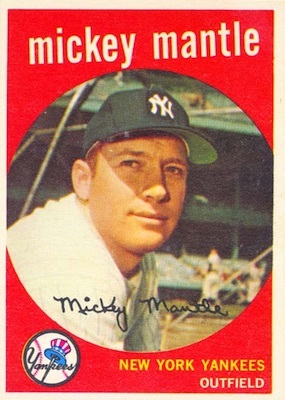 This includes The Sporting News Rookie Stars of 1959 (#116-146), Baseball Thrills (#461-470) and The Sporting News All-Stars (#551-572), as well as combo cards and team checklists. 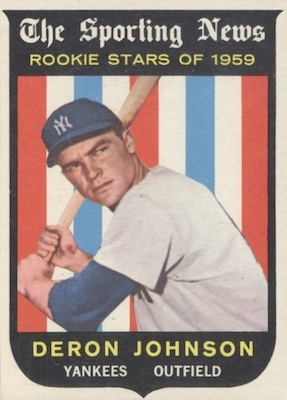 Although the themed combo cards, team checklists and All-Star cards are carried over from previous releases, The Sporting News Rookie Stars of 1959 cards offer a new option to highlight young players. The majority of these Rookie Stars subset cards are official rookie cards are well, but the bigger RC names are found in the traditional base set. This includes George "Sparky" Anderson, Felipe Alou and Bob Gibson. Baseball Thrills covers notable events from the previous year. 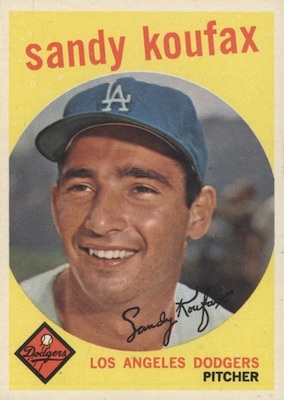 The high-number series in 1959 Topps Baseball, card numbers 507-572, have the lowest print run of all the series in the set. 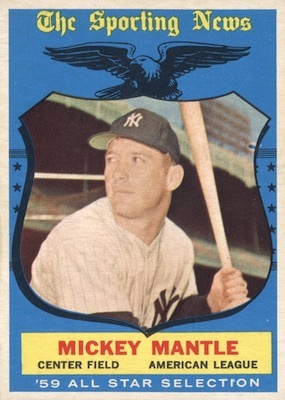 While the low-number cards (#1-110) are a bit easier to find, these cards were also issued in smaller quantities, putting a premium on the key names like Mickey Mantle and Ford Frick. The MLB Commissioner at the time, Frick also enjoys an added boost as the first card in the set. 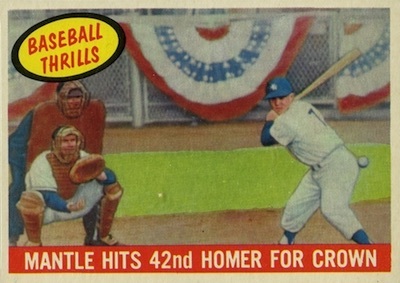 Given the new design, expanded checklist and new subsets, there were bound to be some mistakes in 1959 Topps Baseball. In fact, quite a few error cards made their way into the set. Several errors were corrected, resulting in mutiple variations. However, most don't yield any premium. Warren Spahn and Haywood Sullivan actually have three different versions of their base cards. 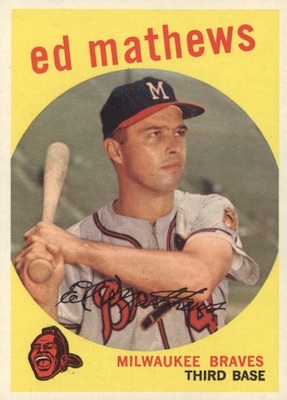 One oddity about the 1959 set that often gets overlooked is the fact Topps manufactured a version of the set for the Venezuelan market. It contains only the first 196 cards and was printed on a lower-quality paper stock. Virtually idential to the main set, they can be distinguished based on the small printing/distribution info listed on the back. 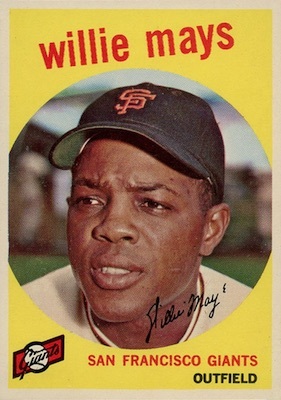 The 1960s would see Topps dive into the waters of test marketing rather aggressively and this appears to be one of the first forays into their well-documented test programs. Collectors can also find three-card salesman ads that are basically un-cut panels. 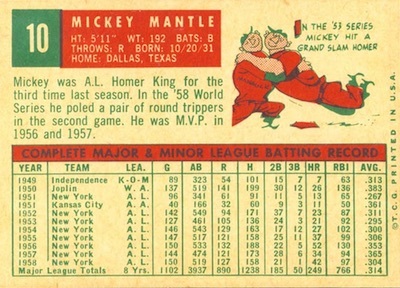 Fronts match the cards in the 1959 Topps Baseball set and the back includes an ad and the back design for either Nellie Fox or Ted Kluszewski. 1959 TOPPS # 370 PETE RUNNELLS SGC 80 RED SOX BASEBALL !! 1959 TOPPS # 473 MIKE FORNIELES SGC 80 RED SOX BASEBALL !! 1959 TOPPS # 211 BOB BLAYLOCK SGC 80 CARDINALS BASEBALL !! 1959 TOPPS # 113 TAYLOR PHILLIPS SGC 80 CHICAGO CUBS BASEBALL !! 1959 TOPPS # 318 ROCKY BRIDGES SGC 80 DETROIT TIGERS BASEBALL !! 572 cards. Shop for base sets on eBay. 1959 TOPPS #98 ARNIE PORTOCARRERO PSA 7+++ !! One of the top 5 card designs of all time. Also entertaining is Lew Burdette (#440), a right-handed pitcher posing as if he were left-handed, like his teammate, Warren Spahn. One of the most interesting sets from the 1950’s, the 1959 Topps set is a very challenging set to complete, with cards from the last series (#507-572) tough to find. Fortunately, I completed the 1959 set sometime in the late 1980’s, at a time when old baseball cards were a lot cheaper back then. Back in the early 1980’s, you could buy the ’59 Mantle for about $10, while Mays and Aaron sold for around $8 each.